APRIL 2011 UPDATED: READ SYLVIA'S ARTICLE PUBLISHED IN RESOLVE (SPRING 2011) MAGAZINE. 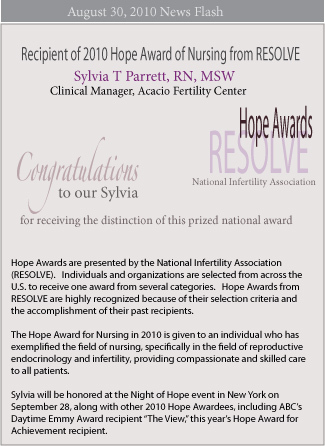 Congratulations to Sylvia T Parrett, RN, MSW, recipient of 2010 Hope Award of Nursing from RESOLVE. Sylvia is the Clinical Manager at Acacio Fertility Center. She received the distinction of this prized national award because of her exemplary patient care and leadership in the field of reproductive endocrinology and infertility. After 16 years and 10 cycles of fertility treatments I can proudly say I am a mother of 4 wonderful children, a dream I never thought possible. It is because of this journey that I bring hope for our patients and believe in their potential to become parents. 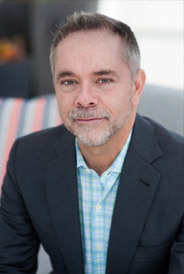 Dr. Acacio believes in giving everyone a chance to try, and he works with each patient based on individual history and needs. His personal touch, accessibility and profound kindness make the Acacio Fertility Center the place of choice for all who are looking for hope and someone to trust." Complementing her nursing degree from St. Benedict College, Sylvia earned a Masters Degree in Social Work from the University of Illinois, Chicago Campus. Her career has demonstrated tenacious devotion as a nurse, as well as relentless advocacy of those who wrestle with uncertainty and tremendous challenges. Over a span of 31 years, Sylvia has worked with cancer patients, medically disabled children, and hospice patients. Her experience has been shaped by a myriad of responsible roles, from being an ICU nurse, to nursing administration in a Critical Care Unit at the University of Chicago, teaching positions in college nursing programs, and manager of home care for the terminally ill.
As a Social Worker she managed a home for wayward children, worked in child Abuse and Federal Probation, taught in the Reformatory for men in Minnesota, and volunteered at the VA for our soldiers who needed a friend. Sylvia and her husband have been foster parents to many.